VAnetworking.com is regularly profiled in national magazines, books, newspapers, television shows and radio stations worldwide. Click on links below to read full stories. Recommended by the Dr. Phil Show as a one of the top web sites that show you how to earn money while working from home. VAnetworking member, Diana Ennen, mentioned our network in her recent article in Reader’s Digest as a good place to gather how-to information from experienced assistants. VAnetworking featured in NEW book at Amazon called “Starting Over – 25 Rules When You’ve Bottomed Out” by Mary Lee Gannon. Chatelaine Magazine – Celebrating 80 Years Together Collector’s Edition quotes Tawnya Sutherland as a chic business owner of the largest virtual assistant network going. 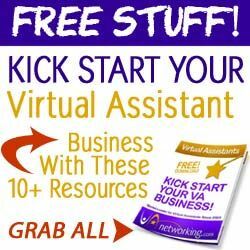 Virtual Assistants – Outsource to Grow Your E-Business – Interview with Scott Fox Author of # 1 Best Seller at Amazon.com’s E-commerce and High Tech Careers for his book Internet Riches. Listen to the interview. Tawnya Sutherland explains what a Virtual Assistant is how you can become one in Amazon’s top Bestsellers book Will Work From Home authored by Tory Johnson and Robyn Freedman. Tawnya Sutherland is featured as one of the Experts in Startupnation’s Start Your Own Mom Business eBook series. Tawnya Sutherland was coined the VA Poster Child in Michael J. Russer’s book, The Obsolete Employee, How Businesses Succeed Without Employees and Love it! Regular contributor/writer for the Virtual Assistant Magazine (2011-12). American Council on Exercise magazine promotes VAs with their article on Get it Done With the Help of a Virtual Assistant. VAnetworking.com was featured in the book, “Shoestring Venture: The Startup Bible,” a reference book with resources for entrepreneurs coming in July, 2008. Tawnya Sutherland featured in Inc.com 11 Businesses You Can Start In Your Pajamas in 2009. Tawnya Sutherland was recently interviewed by Brian Greenberg on Philadelphia’s Renaissance Radio Station, WNJC 1360AM to spread the word about Virtual Assistants. Listen to the interview. VAnetworking Shares Tips for Communicating Effectively by Partnering with a Virtual Assistant – June is Effective Communication month and the Virtual Assistants at VAnetworking.com, the world’s largest social networking community for Virtual Assistants and virtual entrepreneurs are sharing their tips for using a Virtual Assistant to communicate effectively in your business. New Certification Program Breaks Ground for Virtual Assistants Globally. Tawnya Sutherland, founder of the world’s largest global network for Virtual Assistants, has brought together industry leaders from the four corners of the world to create a one of a kind certification program for Virtual Assistants. Founder of VAnetworking.com, Tawnya Sutherland receives OIVAC’s 2008 Thomas Leonard International Virtual Assistant of Distinction Award. The Virtual Assistant Millionaire: Craze or Godsend for Working Moms? What Would the Business World be Without Our Virtual Assistant Keeners?!! VANetworking.com Announces a New Back-to-school Scholarship for New, Part-time, or Full-time Virtual Assistants. Reader’s Digest, May 2007, Page 167), suggests the Virtual Assistant Networking Forum as a good place to gather how-to information from experienced assistants. VAnetworking Announces the NEW VA Talk Show Podcast – Where VAs Talk The Walk!